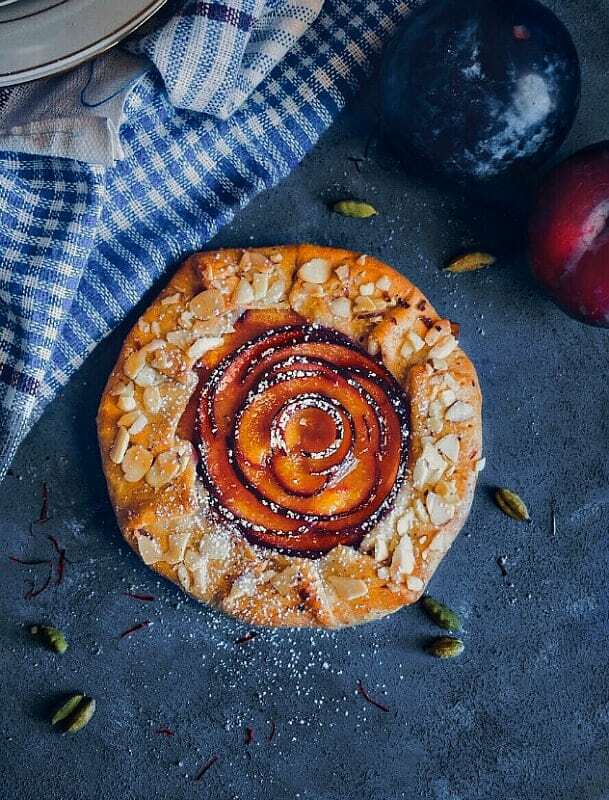 Saffron Cardamom Spiced Plum Galette: a delicate flavored, crisp and delicious galette made using biscuit dough. 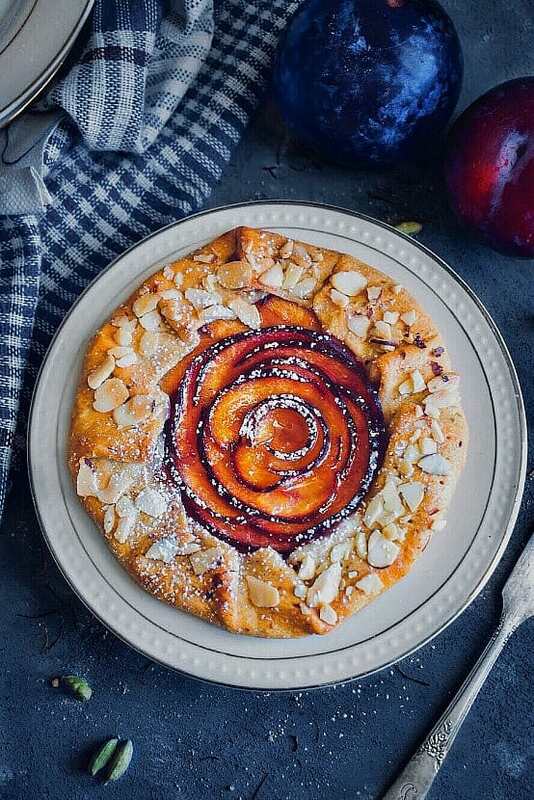 Saffron Cardamom Spiced Plum Galette is perfect for winters. 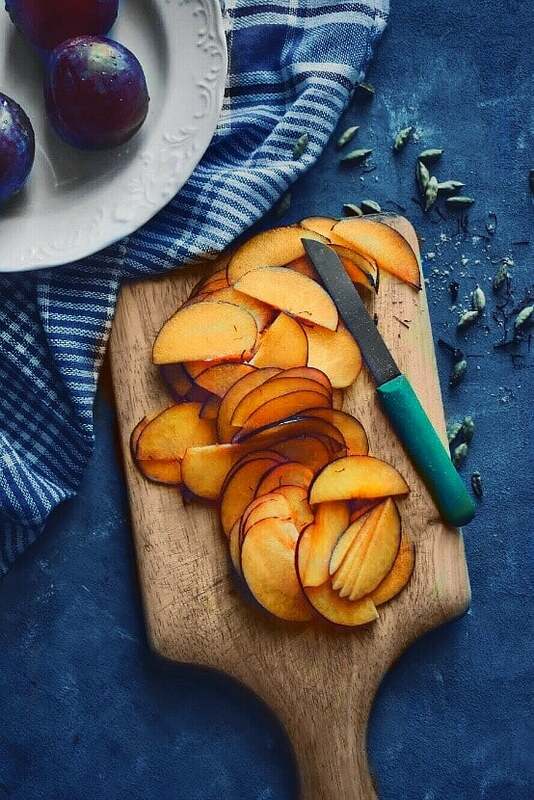 I’m so excited about the availability of fresh seasonal stone-fruits in the market and these Saffron Cardamom Spiced Plum Galette . We are a huge fan of rustic dessert and I’m always experimenting with different flavors. And you MUST try this deliciousness before the fresh plums season gets over as it’s worth every effort you take to make them. Perfect for Winter breakfast, brunch or even dessert (think topped with fresh creme’ or vanilla ice-cream), they are just yummmm! 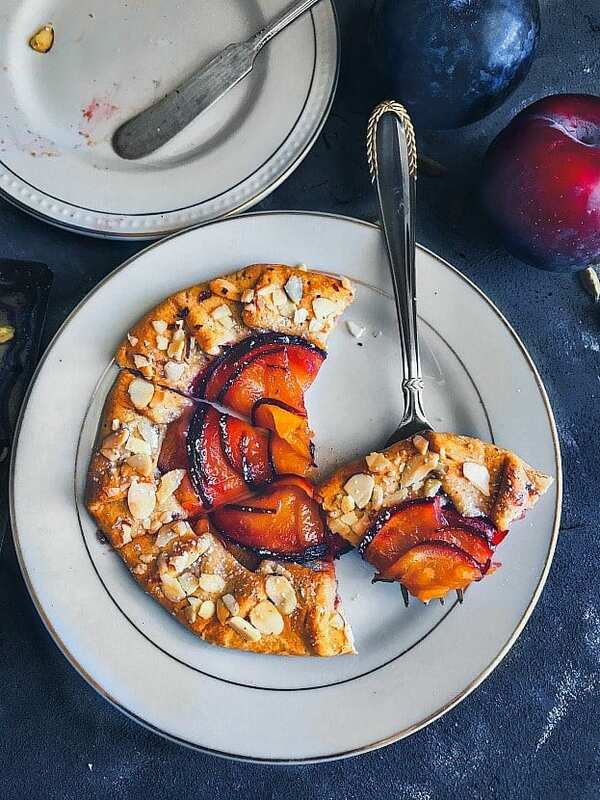 We got a big batch of juicy plums from our local farmers market and after devouring some of them instantly, I got down to make this Saffron Cardamom Spiced Plum Galette. As I did mention in a couple of my earlier posts too, we love tarts, galettes, pies and what makes them absolutely easy to make – Biscuit Dough !! Seriously, if you have not tried it, then you need to get one ASAP. 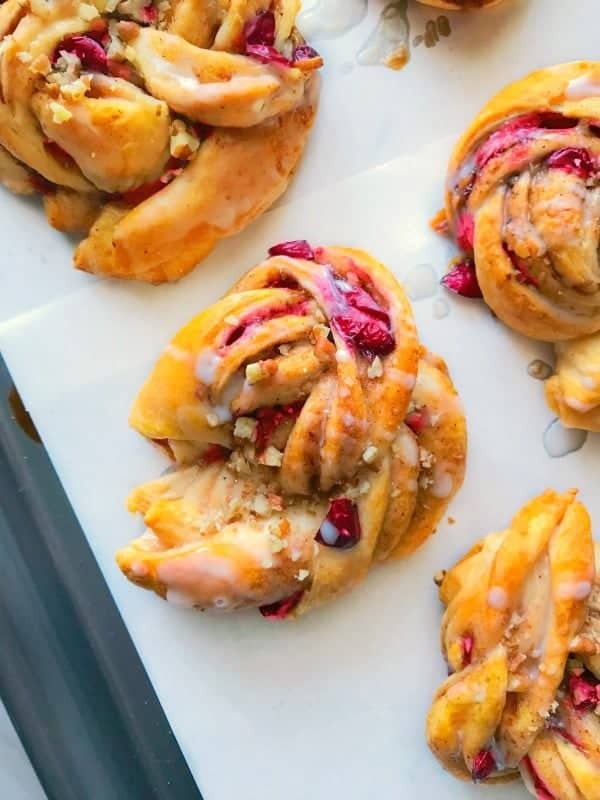 It makes life so much easier and these pastries so much quicker to make. For tarts/pie crusts, you do need to roll the biscuit dough slightly thinner and dab with fork/knife so they don’t puff up. It’s especially my MOST used dough/ingredient in many festive/holiday recipes. However, if you love creating your own dough and make these from scratch, that’s great too. So, getting back to our Saffron Cardamom Spiced Plum Galette, we made 8 medium size galette with 4 biscuit dough. 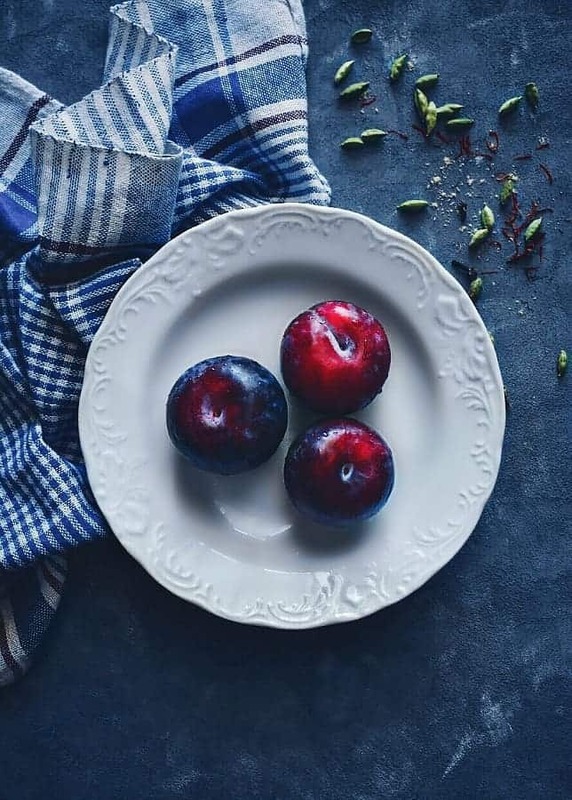 To add a little more flavor to the plums, we are marinating them in a mix of saffron, cardamom and sugar – soooooo yummmm! I suggest to do the mix and keep it aside for atleast 20 minutes and roll the dough in the meantime. The dough needs to be thin (or thick as per your choice), and we are also adding a little bit of peach jam for extra flavors. Now, I’m literally Obsessed with the rose pattern and had been thinking of doing the ‘Rose Tart’ since last year. 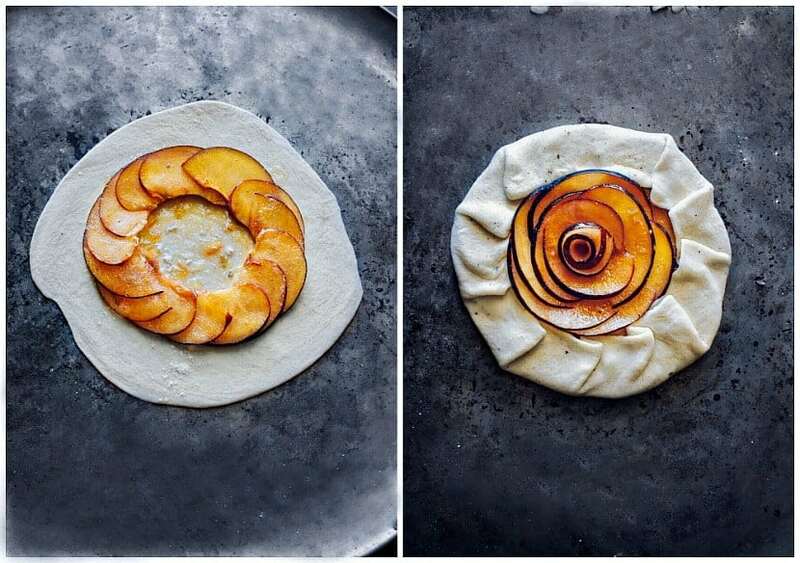 However, that didn’t happen, so I shaped the plums in my Saffron Cardamom Spiced Plum Galette to look like roses. 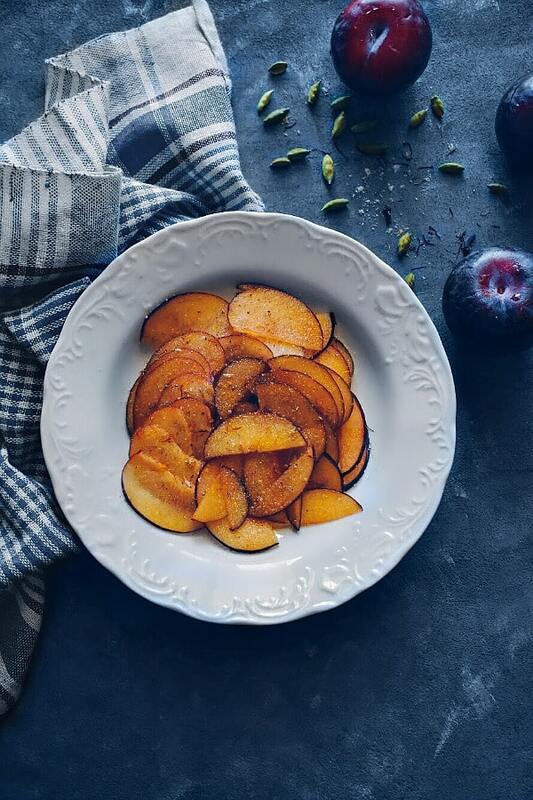 Since the plum slices are marinated in this mix, it becomes even more easy to mold them into any shape. They didn’t break even while rolling them. Once the plum slices are all arranged like roses, simply roll up the crust and sprinkle with sugar and almond. Then I brushed them with a golden mix on top (no eggs) and baked for 15 minutes. I baked all 8 galette at the same time as I have a large oven, however, they can be baked in batches too. 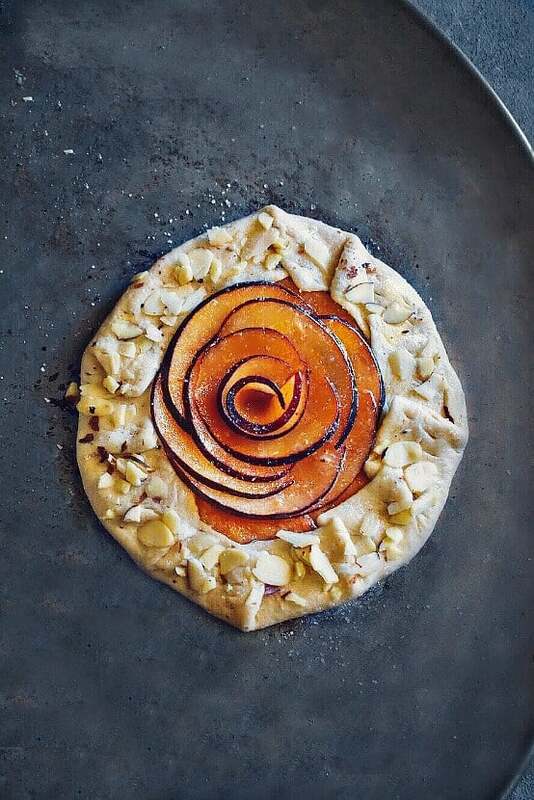 So, here’s our Saffron Cardamom Spiced Plum Galette in all it’s beauty. It’s crispy on the outside with a flavorful melt in your mouth filling in the inside. 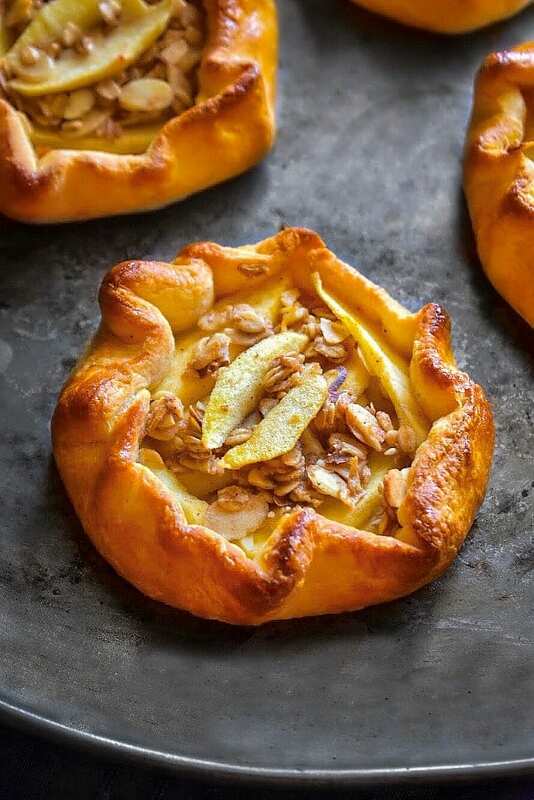 Go ahead and this galette for your Breakfast, Brunch or Dessert and enjoy with loved ones. You can even top them with fresh creme’ or a scoop of vanilla ice-cream for all that extra deliciousness. In a bowl, add milk+butter and whisk. Keep this mix aside to brush the galette before baking. In a large bowl, add plums, cardamom, saffron and sugar. Mix everything using a fork or by hand (making sure the plum slices are evenly covered). Let this filling soak the flavors for 15 minutes to 40 minutes. Now, take 1tsp of jam and spread it evenly in the circle (about 2-3 inches). Sprinkle some flour and place the sliced plums to form a big outside circle (see picture for demo). Now, take more sliced plums and carefully place them inside the circle. Finally, roll one slice like papper and place it in the center. (This completes the rose like shape). Now, carefully fold or crimp up the dough edges around the filling. Start folding the crust free-style and complete the whole circle. Now, using a fork/knife, dab the crust on top to prevent it from puffing up. Now sprinkle slivered almonds and sugar. Similarly fold all the galettes. Arrange the galettes in a baking tray (leaving some gap between each of them). Brush each galette with the milk+butter mixture. Bake for 15 minutes and remove from oven to help cool a bit. Serve as is or topped with creme fresh or vanilla ice-cream. 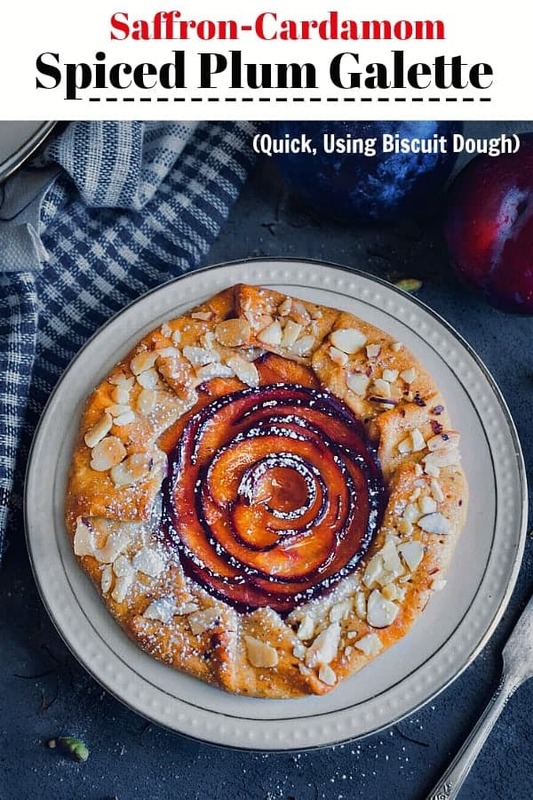 3 Replies to "Saffron Cardamom Spiced Plum Galette (Using Biscuit Dough)"
This is my kind of dessert. I wouldn’t mind eating it for breakfast too! What a beautiful combo. I love cardamon flavors in the plum filling! Yum! Thanks so much and definitely one of my favorite combo too. Wow, This looks fab!!! I have to try them for our upcoming brunch.